These days foreign companies are actively investing in Indian market because they understand business potential and ever-growing opportunity in India. There are plenty of examples such as Amazon, Uber and the list goes on. Now search engine giant Google has made its way in India by launching Tez android application. Not just android but even iOS users can enjoy this app on their iPhones. This isn’t the first app Google has ever launched in India. About few weeks ago they introduced Google Aero app which allows user to order food items online from nearby restaurants. 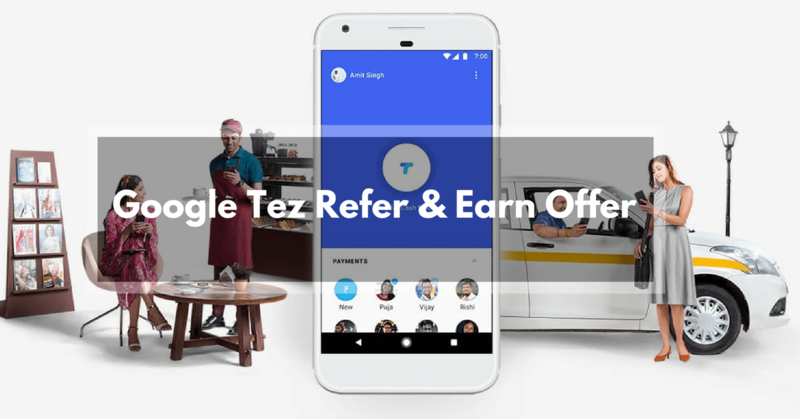 Anyways, in this post we will discuss about Google Tez referral code & their trending ‘refer & earn’ program. Let me tell you an interesting thing first! You can earn massive 9000 Rs from Tez referral offer and it is easily achievable. What’s more? This reward amount is bank transferable, means you get real cash just for inviting friends to try this awesome app. Before getting into the context, let’s see what is Tez & how does it works. 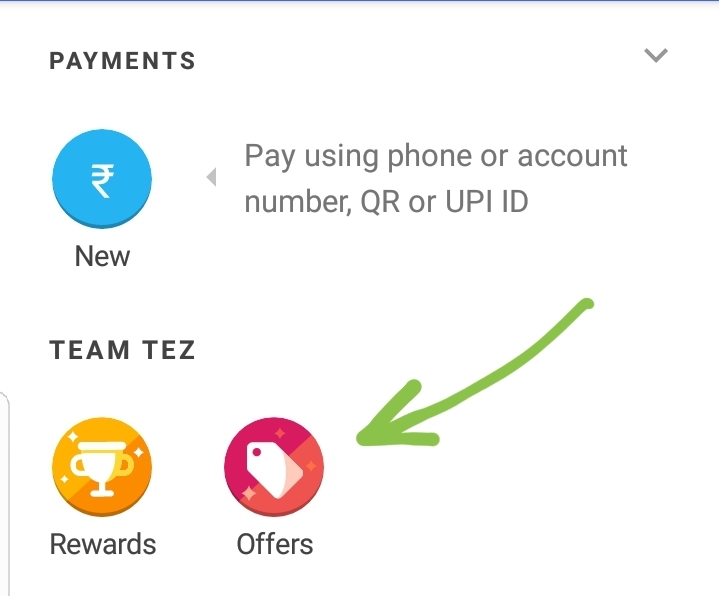 Google Tez lets you make payment with the help of UPI (Unified Payment Interface). It’s fast, simple and safe. Being available in 8 regional languages, Tez has extremely cool interface with no messy ads or unnecessary stuffs. 1] First of all, download Tez app on your android phone. Enter referral code 8d9gQ if it prompts. But where to enter this code?? 2] Now open it and enter your mobile number. Make sure that the number you have provided is already linked with any of your bank account. 3] After adding mob number, Tez will start searching for the bank accounts and it will show you on the screen. Select the one which you want to set as a default for making & receiving payments. 4] Once the above step is over, start sending money or try making payment from Tez. 6] As soon as you complete the transaction, you get 51 Rs bonus! 8] There are 2 options : Rewards & Offers. You have to select 2nd option as shown in the screenshot. 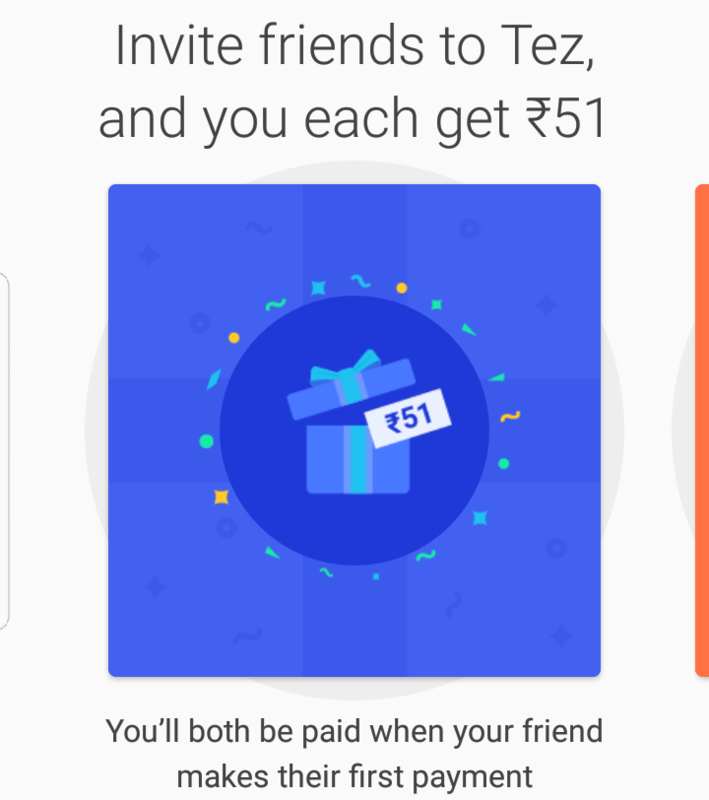 Invite Friends to Tez and You Each Get 51 Rs. You will both be paid when you friend makes his first payment. 9] Simply click on invite friends and note down your referral link. Share it using whatsapp, direct messaging or in any other way you are convenient with. 10] Your friend has to download Tez from your link & make any payment using UPI. 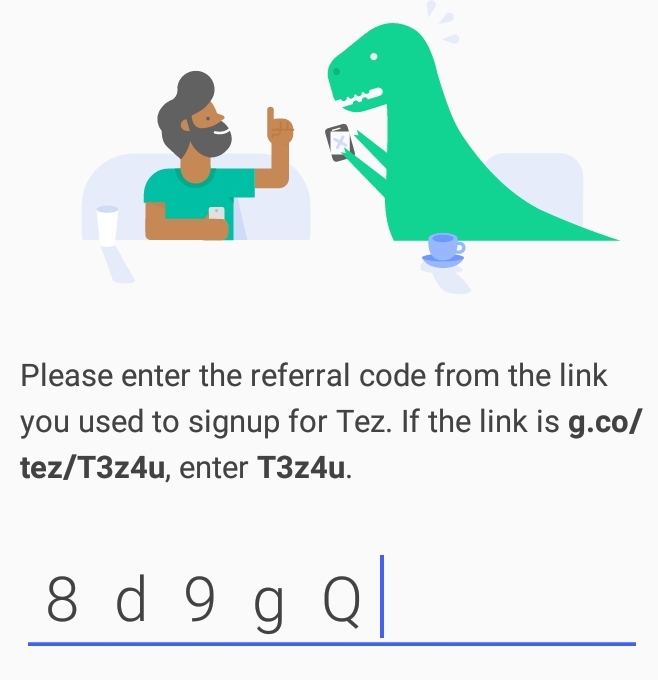 Actually, there is nothing like Tez refer code and it’s not required at all. Only important thing is your referral link and you can easily generate it using the steps mentioned above. 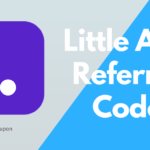 Recommended for you : Refer Friends to PhonePe to Get Rs 100 Instantly! 1] This offer is valid till 31st March 2019. 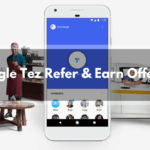 2] You can earn maximum 9000 Rs per account from this Google Tez app referral program. 3] Invited friend must be a new/first time user of Tez. If he has already installed and used the app before then you will not get referral bonus. 4] All the money earned from this campaign can be withdrawn to your bank account. 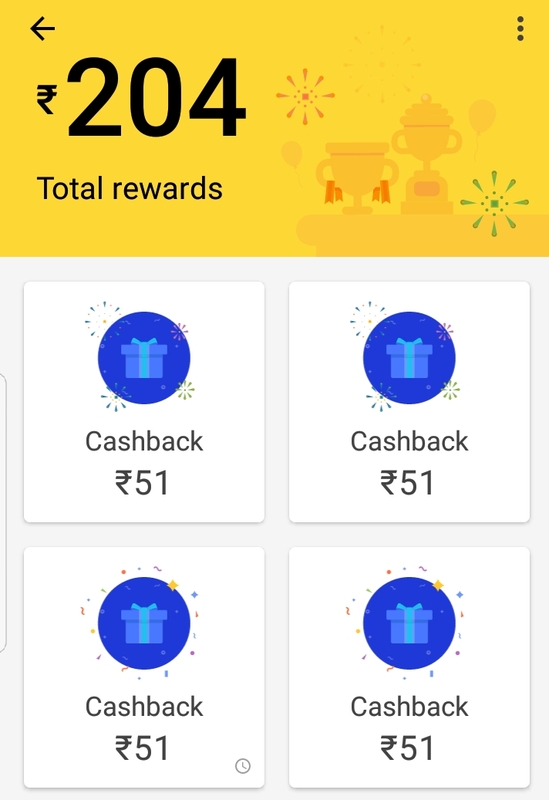 How to Redeem or Withdraw Referral Cashback in Bank? You don’t need to do anything to transfer money from Tez wallet to bank account. Within 48 hours, your cashback will be automatically deposited in the bank account which you have linked with Google Tez app. For any other information, please leave your comment below. I will get back to you as soon as possible. i have send 5000 to my friend account. Amount is debited but not credited. Could you please resolve my problem.